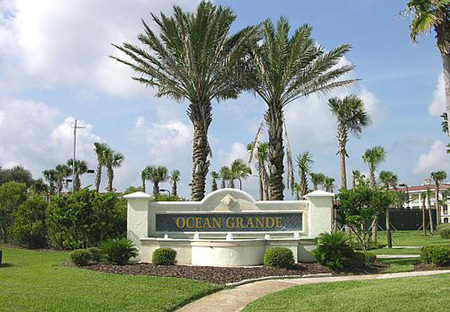 Ocean Grande condominiums in Ponte Vedra Beach, Florida. Ocean Grande is a luxury, three-story 204-unit condominium complex by Devlin Properties located on the Intracoastal Waterway along A1A at Serenata Beach in South Ponte Vedra. Across from the Ocean Villas at Serenata Beach, Ocean Grande is a place where the architectural style blends with the natural landscape and where neighbors call to each other across their balconies. Each home has a distinct Mediterranean flair with luxurious and spacious 3 bedroom/3bath floor plans starting at over 2,000 sq. ft. and featuring terraces with panoramic nature views, gourmet kitchens with granite countertops, private gated entry and garage parking. Each unit includes a separate laundry room with super-capacity GE washer and dryer, GE Profile kitchen appliances, gas fireplace, high ceilings, and designer raised panel cabinetry. The stunning Master Suites have huge walk-in closets and the Master Baths offer garden tubs and tiled, walk-in showers. Nestled between the Intracoastal Waterway and the Atlantic Ocean, Ocean Grande has breathtaking views and the finest amentities including membership in a private oceanfront Beach Club with a five-star restaurant, meeting facilities, state-of-the-art fitness center, and sparkling swimming pools with a 12 foot cascading waterfall. Recreational activities are abundant in Ponte Vedra and include watersports, fishing, beachcombing, tennis, and planned social events. Ponte Vedra offers some of the finest golfing and golf courses in the world such as the PGA Tour Headquarters, the Tournament Players Championship (TPC), Stadium Course at Sawgrass, the World Golf Village, the World Golf Hall of Fame, as well as the home of the Association of Tennis Professionals. Just a short drive from Ponte Vedra in Jacksonville, you will find over 30 challenging golf courses; beautiful parks; the Cummer Art Gallery; the Florida Theater; the Performing Arts Center, home of the Jacksonville Symphony Orchestra; EverBank Stadium, home of the Jacksonville Jaguars and many other cultural and recreational outlets. St. Augustine is a charming historical town that dates back to the 1500's and is the oldest remaining colony in the US so the historical sites and museums are quite intriguing. St. Augustine was discovered by Ponce DeLeon and is the home of the famed Fountain of Youth and the old fort Castillo De San Marcos, as well as the Bridge of Lions, Old St. Augustine Village, the original Ripley's Believe It Or Not museum, and Florida's first lighthouse. Horse drawn carriages wander through cobblestone streets between masterpieces of historic Spanish architecture and the past is brought alive. Don't miss your opportunity to live in the paradise you've always dreamed of, call today for your personal tour of Ocean Grande at (904) 307-8998. Living area 2,035 Sq. Ft.
Total Under Roof 2,247 Sq. Ft. Living area 2,036 Sq. Ft.
Total Under Roof 2,248 Sq. Ft. Living area 2,239 Sq. Ft.
Total Under Roof 2,644 Sq. Ft.